Hidemi Hondou (本堂 瑛海 Hondō Hidemi), also known by her alias Rena Mizunashi (水無 怜奈 Mizunashi Rena? ), and by her Black Organization codename Kir (キール Kīru? 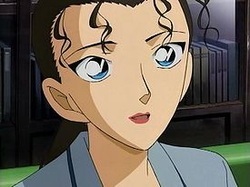 ), is a character in the manga and anime franchise Detective Conan. Hidemi Hondou is an undercover CIA agent who has managed to infiltrate the Black Organization under the codename Kir. She has a younger brother named Eisuke. She was forced to kill her father, Ethan Hondou, who was also in the CIA, after a mistake nearly caused her to lose her cover in the organization. Ethan Hondou (本堂 イーサン Hondō Iisan) is a character in the manga and anime franchise Detective Conan. Ethan Hondou is also known by Conan as the deceased father of Eisuke Hondou and Hidemi Hondou (Rena Mizunashi or Kir). He was a CIA agent who went into deep cover as a Black Organization member.